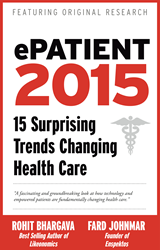 ePatient 2015 demonstrates that the future of health care is about more than who is paying for it. The book also breaks new ground partly because it provides answers to questions health consumers have never been asked before. Nearly half of ePatients living in the United States say the Web has helped them get treatment faster, better communicate with their doctors, understand medications, or otherwise “CareHack” the health system over the past three years, according to new data published in EPATIENT 2015: 15 Surprising Trends Changing Health Care (IdeaPress Publishing; HARDCOVER; December 2013; $36.95; 240 pp. ; illustrated; ISBN 9781940858005). The book, co-written by bestselling author Rohit Bhargava (Likeonomics + Personality Not Included) and noted digital health futurist Fard Johnmar, also suggests innovators who focus on developing technologies and tools aligned with health consumers’ culture, background, lifestyle, and budgetary needs will be well-positioned to succeed socially and financially in tomorrow’s digitally-driven global health industry. African American ePatients were twice as likely as Caucasians to say purchasing and accessing digital health tools that fit their background and culture is “very important” to them. EPATIENT 2015’s original research is combined with curated expert interviews to describe how technology, history, culture, and policy-making are combining to fundamentally alter how health and medical care is delivered, accessed, and communicated in the U.S. and globally. Rather than focusing on the current political debate about health payments and ideology, the book takes a rare optimistic view of how health care itself will change over the next two years and beyond. Innovations in computing technologies are helping to make health and medical care more efficient, safe, and effective for all patients. A philosophical and operational shift that considers the unique genetics, behaviors, and medical histories of individuals instead of treating them based on inflexible or non-personalized guidelines and traditions. A range of Web, social, and mobile tools are helping patients navigate the new health insurance landscape, select providers, assist in their own care, and provide emotional support. Moving on from the themes, the book outlines 15 trends that describe the future of health care. Nine of the trends are listed below. Empathetic Interfaces: Health technology moves beyond focusing on accuracy and functionality to incorporate more intuitive design and processes aimed at making digital tools more responsive to emotional needs, or more human-like. Unhealthy Surveillance: New surveillance technologies combine large amounts of digital, clinical, and behavioral data to track the health of individuals or groups, and also raise significant privacy and security concerns. The Over-Quantified Self: As the volume of clinical and health information collected from wearable computers, passive sensors, and more increases, consumers will struggle to find true actionable value beyond "feel good stats" in this flood of data. Medical Genealogy: Genomics and advances in genealogy will combine to allow patients (and providers) to use ancestral history and genetics to predict the risk of disease, how they may respond to medications, and more. Over time, this valuable data may be passed on to future generations. Healthy Real Estate: Increasing awareness of the role communities play in health and wellbeing will influence where people choose to rent or buy homes. Key considerations – especially for seniors – will include whether streets are walkable, the quality of nearby care and access to social or religious institutions. Multicultural Misalignment: Health technologies will be less effective if they are not optimized to account for differences in age, ethnicity, culture, and more. CareHacking: Forced to increasingly take responsibility for their own care in a complex system, digitally savvy health consumers combine information from doctors, the Web, electronic medical records, and other sources to “hack” the health system. Accelerated Trial-Sourcing: Patients with chronic diseases and other conditions use social tools to find one another, complete the usually costly and complex first stage of discovery for a clinical study and then recruit the right people to conduct the research. For a summary of all 15 trends outlined in the book, please view the infographic located at http://www.epatient2015.com. EPATIENT 2015 features research conducted by the digital health innovation consultancy Enspektos, LLC with a statistically representative group of approximately 400 U.S. ePatients in 2012 and 2013. For research purposes, Enspektos used the definition of ePatients developed by the Pew Research Center: Internet users who have used the Web to search for health content for themselves or on behalf of someone else. Data regarding CareHacking and culturally appropriate digital health tools featured in this press release was collected in October 2013. Rohit Bhargava is the author of four best-selling business books (including the global best seller Likeonomics) and founder of the Influential Marketing Group (IMG). Prior to starting IMG, he led digital healthcare strategy at Ogilvy, one of the largest communications agencies in the world. Fard Johnmar is a digital health futurist and researcher focused on helping people around the world understand how to use health technologies to shape behavior and promote wellbeing. He is Founder and President of Enspektos, LLC, a globally respected digital health innovation consultancy.